And another southside store bites the dust. Sear’s Essential is closing. Liquidation begins mid-March and the store is expected to be closed by May. Great location for a Cracker Barrel! For reasons I’m not even aware of (I think I would need some therapy to draw them out)…I really wanted this guy to move on to the next round. 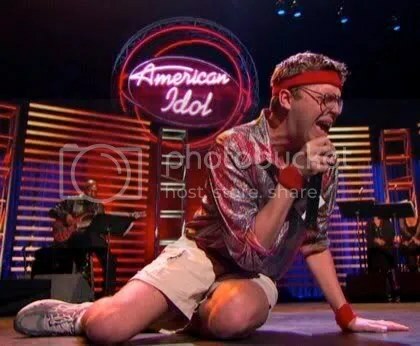 I’m sad his time on American Idol is over. Nick Mitchell AKA “Norman Gentle” is one unique dude…to say the least. I have no idea why non-Christians would think Christians are a bunch of crazies! 1. Tonight (2/26) and tomorrow night (2/27) there will be a children’s wing work party oh yea…I said “party”) to move forward in completing our children’s wing. If you have children at Living Stones…you should commit three hours of your life to one of these opportunities! 2. Mark Ekdahl is starting a Living Stones Church men’s slow pitch softball team. We could have joined a church league, but figured there would be too many fights and cuss words 🙂 at those church leagues so we went with the city league with the Parks & Recreation department. Invite some dudes that you might know who would want to play. Mark is assessing the interest to see about moving forward. If you are interested e-mail him here and let him know you want to play! 3. Sunday afternoon (3/1) from 4:00 – 5:00 p.m. the Intercessory Ministry is hosting a Concert of Prayer. You can come for the whole hour, or just a part. Spend some time praying on your own, or with others. It is an intentionally carved out time and space for you to meet with God. 4. Read Luke 6:17-49 for Sunday’s message. Just finished the message a few moments ago. Very excited to preach it!! “It’s just not deep enough for me.” That sounds spiritual and at face value you might think that the one saying it is really longing for some exegetical challenges from the text (preferably in Greek and Hebrew). But the real translation for this is “I’m looking for something complicated and controversial.” People who want “deep” really mean they love things that are complicated, hard to understand, confusing, and makes people walk away feeling insecure about the correct interpretation of a biblical doctrine. So…let’s agree that when you figure out how to love God and neighbor accurately, we’ll move on to something deeper. “I’m just not being fed.” Ouch. They don’t know it, but they just called themselves out. They just said, “I’m a complete baby in the faith and incapable of feeding myself and thus dependent on my church (or Pastor) to do it for me.” They didn’t mean to, but they did. There is an appropriate time for the church to bear the burden of helping spiritually newborn people in regards to nourishment from the Word of God. But part of that process has to be helping people feed themselves. Helping your two year old cut his food up to eat is pretty normal. If he is 27…it is weird. “The Lord hasn’t given me a release.” This means “I really don’t want to do [something].” It feels weird just saying that, so we lay a spiritual trump card on it. Who can argue that God hasn’t released them? Am I going to oppose God?! In the end, it is just churchy language we adopt to not do something we don’t want to do and aren’t confident enough with our “no” and thus transfer responsibility to God. Just say “no.” It’s O.K. There is always a story behind the story. These phrases are spoken to give an air of spirituality or vagueness to conceal the real truth. Often it is that their feelings were hurt, they feel excluded and left out, they don’t care for the church, the preaching style of the pastor, etc. I get those. Those sentiments can be legitimate and honest. But “deep,” “fed,” and “Lord’s release” is code language for something else. It is church speak. And someone with the gift of discernment and interpretation of languages is required to give the right translations. Good-bye Dane. You can see an after picture here. The dude dropped 100 pounds in just EIGHT WEEKS!!! It was a new Biggest Loser record for first one to lose 100 lbs. in shortest amount of time. And then he goes home and runs a MARATHON with his wife!! Congrats dude (on both the marathon and the wife). Once again, I have to voice my objection to the decisions made by the producers of the Biggest Loser. I understand that ALL shows have a shelf-life. It won’t last forever. Eventually the number of viewers begins to wane and the rankings head south. So the temptation to keep things fresh and novel is always present. And I’m not against change…even change for the sake of change (otherwise everyone ends up in a rut and finds even good change anathema). 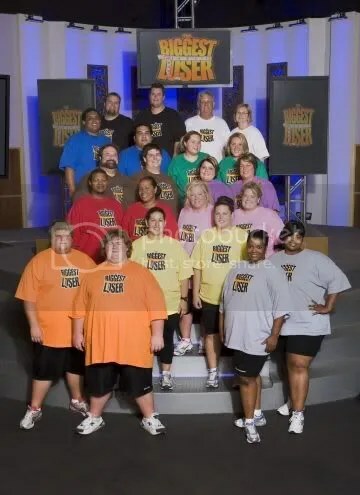 But Biggest Loser is a GREAT show because of the drama of watching lives transformed through MASSIVE amounts of discipline, hard work, intentional choices, and essential introspective reflection on what brought each participant to the point of obesity and in need of RADICAL change. And we get to see the RADICAL change EVERY WEEK!! It is amazing. And we find ourselves rooting each week for the participants. This show is great in-and-of-itself. And switching the teams up and splitting teams and assigning a different trainer doesn’t make any of us more GLUED in to this show. It just irritates us. And because we love the show we keep watching IN SPITE of these gimmicky and ridiculous decisions. It just isn’t necessary. And it leaves people feeling irritated and disappointed. The danger for this show is not in the lack sudden shifts and novel ideas to keep everything “fresh” but doing so with such regularity or absurdity that viewers finally have enough of the feeling of irritation and disappointment and turn to a huge bowl of ice cream while flipping over to American Idol or the Food Network to recover! (by the way…there is a lesson for churches in this too).